Bonjour lecteurs! I hope you had a fabulous weekend. We went out for a long walk yesterday (Frenchie Mummy is trying to keep fit). But today was all about cleaning the house. Not fun but necessary! So today, I need to write about something that makes me happy. 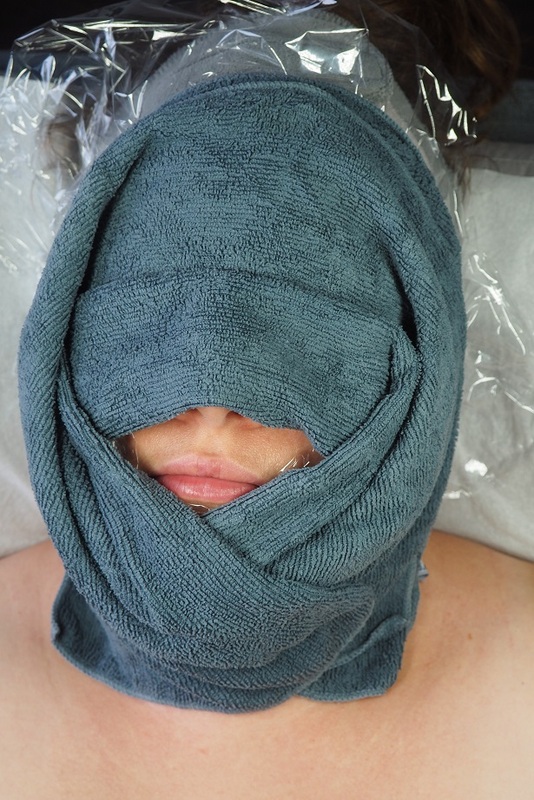 Here is our Skin Aspirations DMK Enzyme Therapy facial Review. No spoiler but let me tell you that having such a facial was way better than today. 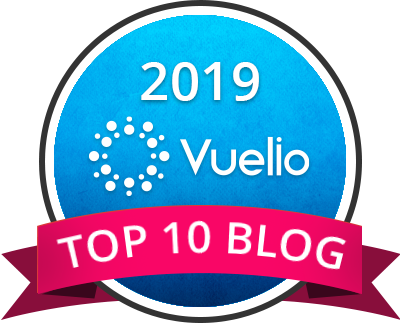 And because I also want you to be contente, we are very happy to announce that we have a fabulous GIVEAWAY with this review. 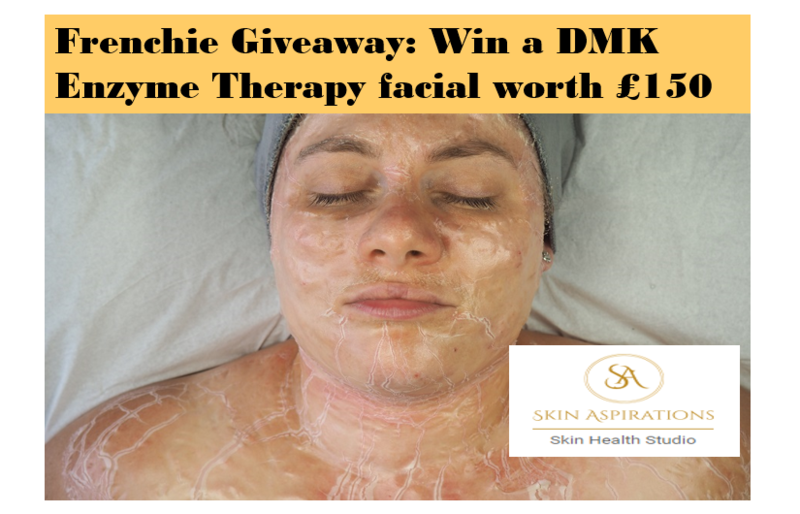 Indeed, one of our lucky lecteurs will have the chance to WIN 1 DMK Enzyme Therapy facial worth £150!!!! Do you want to feel like you are a princess? Then, this competition is for you! Frenchie Mummy loves being pampered and following new trends. DMK Enzyme Therapy facials have been in the press a lot lately. So when Skin Aspirations asked me if I wanted to review their DMK Enzyme Therapy facial, there was no hesitation. But what is it all about? Did you know that enzymes are living substances that regulate health and work with certain minerals in the body to form a natural system of antioxidants that fight corrosive free radicals? Properly formulated, they can remove dead protein, toxins, and other effluvia from the epidermis using a process called ‘reverse osmosis’. Where some cosmetic facial treatments may only act on the surface of the skin, DMK Enzyme Treatments works with the skin. So the treatment is basically using what is already good in you! Ageing skin, sun damage, acne, rosacea or pigmentation? DMK Enzyme Therapy Facials help all these conditions. I had a look online before my appointment as I have never done it before. I was very excited to try such a treatment. Ok, maybe I was a bit scared of it. When you see the pictures of my treatment, you will understand why. The day arrived and we did it! The day of the appointment was there and I left Baba at home with Grumpy Boyfriend. After a quick stop at la boulangerie for a coffee and a sneaky croissant, direction Chelsea where the Co-Founder of Skin Aspirations, Simona was expecting me. The clinic is small but clean and feels bright. No doubt you can relax and forget about everything in there. Simona was quick to explain to me the process and check my skin’s condition. Soon, it was time to do it! We started off with a deep milky cleanse. My skin was already feeling clean and soft. We carried on with a scrub to exfoliate the pores. Simona was very effective, using a brush to apply all the products. Firm but soft, it was clear that she knew what she was doing. She was also more than happy to answer any of my questions. Since then (and thanks to her advice), I am making sure that I protect my skin from the sun and I apply my skin products with a brush. It feels so much more professional. Before applying a sebum preparing for extractions, she got on with it. Thank god, I didn’t have many blackheads. This was not my favourite part of the treatment. But I must admit that it was actually less painful than I would have imagined. Once this step was over, my pores were reduced to avoid inflammation and irritation. This was the main part of the facial. It increases blood and lymph flow to the skin. Gently applied onto my face and neck, the Enzyme mask quickly became tight. I literally felt my skin shrinking. But it was not as painful or uncomfortable as it looks like in the pictures. Honnêtement, I had looked into it before going to my treatment and the snaps I saw online scared me a bit. But actually, it was not suffocating. Bien sûr, I felt the mask tight up on my face, but I managed to relax for the next 40 minutes. Frenchie Mummy turned into a zombie! Once the mask was fully removed and I was free, she applied some drops to avoid any inflammation. Followed by a fresh gel to strengthen the immune system, my skin was eventually boosted with a Vitamin C serum. Even the eyes’ area. Actually, I was the perfect target for a vampire. Lucky it was daylight! The therapist finally put some mist to help the cream penetrating (with Seba E with protective acid mantle). And I mentioned before, we finished the facial with some DMK sun cream to protect my face from UVR. Beaucoup de vocabulaire technique here… I know. So basically, what did I make of my Skin Aspirations DMK Enzyme Therapy facial? Pas de surprise, I loved it! It felt like being a new woman while leaving Chelsea. 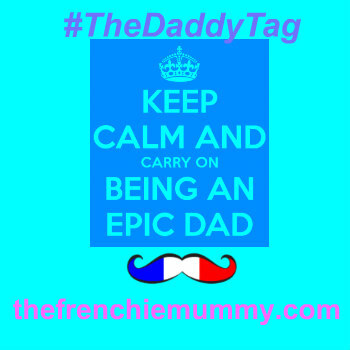 I was actually very triste to be back to my mummy life… Frenchie Mummy would have loved being a princess for a bit longer. Alright, I stopped by some designers boutiques and noticed a fabulous pair of boots on the way home. But I was good and didn’t buy anything! Reading the details of the treatment, it is obviously meticulous but so worth it. For about 1 hour and a half, the facial really did a great work. I know that the pictures are quite impressive (my skin reacted well to the treatment), but it didn’t feel intrusive at all. My face was fresher and plumper without a doubt. And I still felt the effects over the next few days. What I also liked about it was all the natural products used to avoid inflammation or irritation. I have quite a sensitive skin, but it didn’t hurt nor felt uncomfortable. Two days later with very little makeup on. 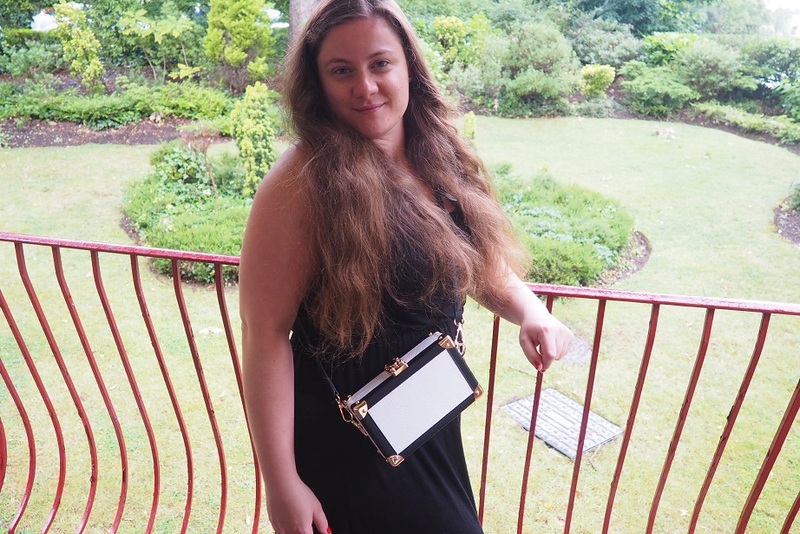 Ready to party with the girls! Over the next few weeks, there was no denying that my skin was much clearer and much more glowing. This is something you have to experience once in your life! I tell you what! 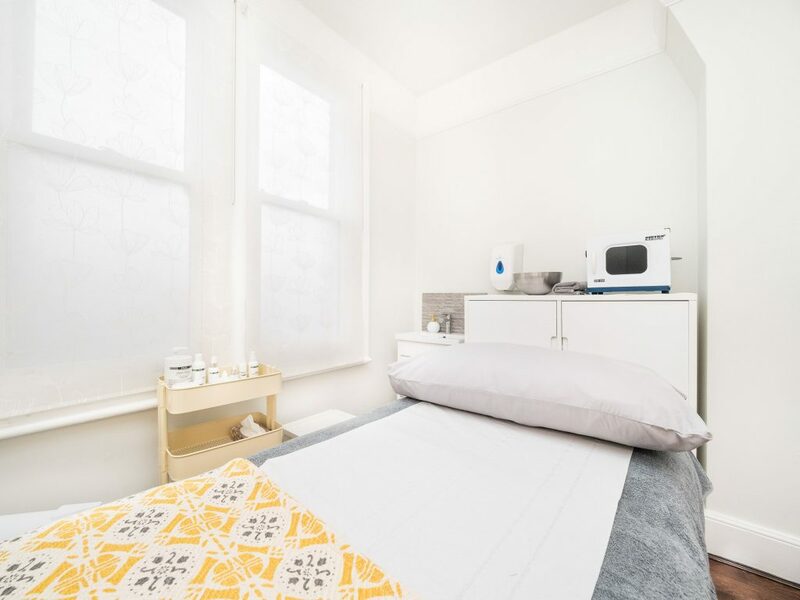 If you fancy regenerating your skin (or just experience something else), the Skin Aspirations DMK Enzyme Therapy facial is available on the website here from £150. No need to say that you will not regret it! Skin Aspirations DMK Enzyme Therapy facial Review – GIVEAWAY! So feeling like you could do with a little treat like us? This is your lucky day as we have a free DMK Enzyme Therapy facial worth £150 for you to win! Please note that this facial is not suitable for people who are on Roaccutane or in the first trimester of pregnancy. The giveaway doesn’t include transport, so make sure you are able to go to Chelsea before entering it! 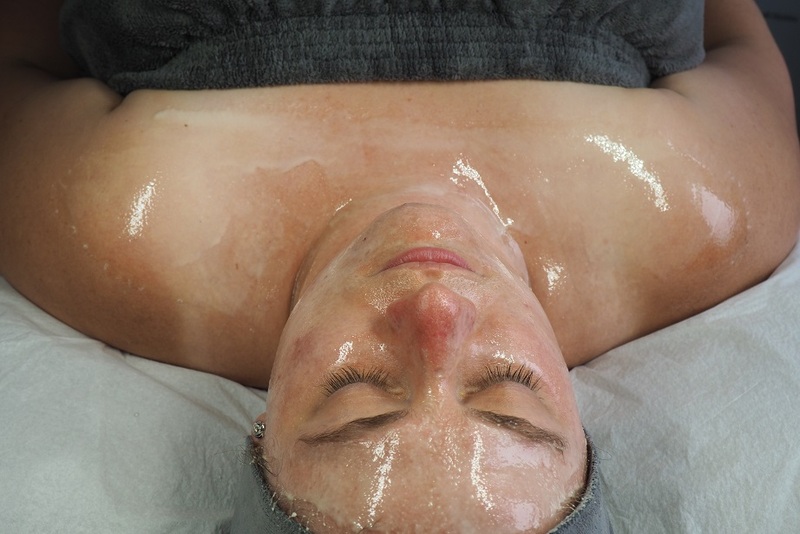 Remember that this facial is worth £150! Don’t concentrate on my Frenchie face. I know it looks scary! This giveaway starts on Sunday 3rd September at 7 pm and ends at midnight on the 3rd October. Provision of the prize is the responsibility of Skin Aspirations. The prize doesn’t include transport to the clinic in Chelsea, London. Disclosure: I received a free treatment in exchange for an honest opinion. And let me tell you that it feels good to have a little treat sometimes! I have combination skin with some very dry patches and I also have sun damage. I have the dreaded combination skin which is prone to break outs…funnily, my skin is worse in my 30’s than it ever was in my teens! Mine are blackheads and blind spots. Yuck. my skin is very dry especially around my eyes and nose! As I have aged :- Dry skin, particularly in the Winter months. 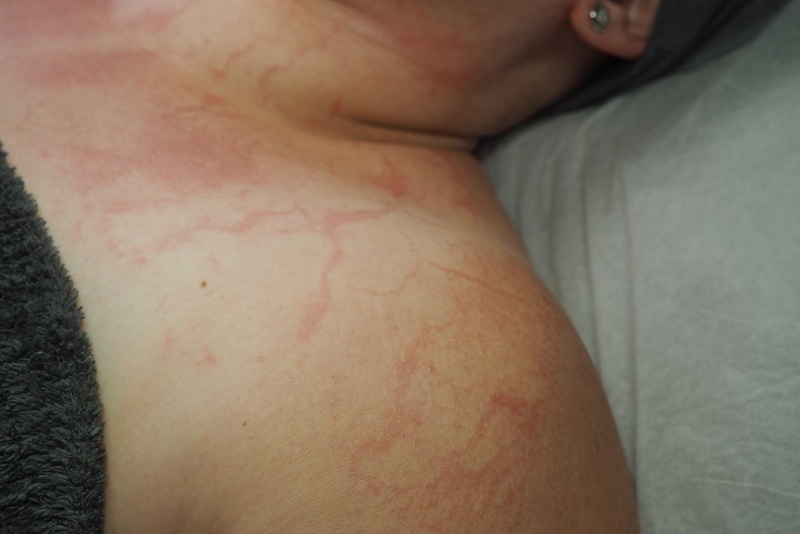 Seborrhoeic Dematitis / Eczema patches some years ago. I believe that this week is National Eczema Week. Sensitive skin is a real issue! I’m getting so many break-outs at the moment! Combination oily and dry! ? just of recent I’ve developed some acne under my chin…. 36 and acne yes I feel like I just rewound back to my teens again. I suffer from eczema and as I am getting older I also suffer all the problems of a mature skin. On my face I suffer with excema and incredibly dry skin. On my body my skin is oily! No happy medium!